We anticipate that there will be approximately 200 student participants for the Vancouver Island Regional Science Fair. To evaluate projects and help to run the Science Fair a large number of judges and assistants are needed. If you have an interest in science and wish to help foster an appreciation of science in students from Grades 4 through 12 register below to help. 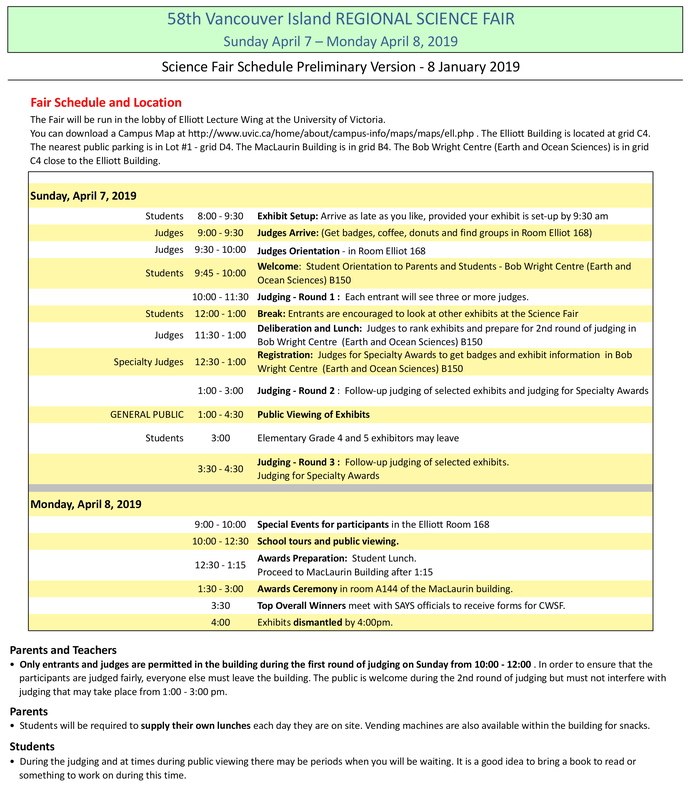 The schedule for the Science Fair can be found further down this page. Judges are needed on Sunday morning, April 7 and would be expected to evaluate about 6 projects as part a team. Some judges may be required in the afternoon as well. It is an enjoyable and rewarding experience. Registration is now open: Deadline is Tuesday, March 26. Volunteers for judging Specialty Awards on Sunday afternoon do not need to register, but names should be communicated to the organizing committee. You can download a Campus Map. The Elliott Building is located at grid C4. The nearest public parking is in Lot #1 – grid D4. The MacLaurin Building is in grid B4. The Bob Wright Centre (Earth and Ocean Sciences) is in grid C4 close to the Elliott Building.